Railtown 1897 State Historic Park Volunteer help visitors understand why This Place Matters. 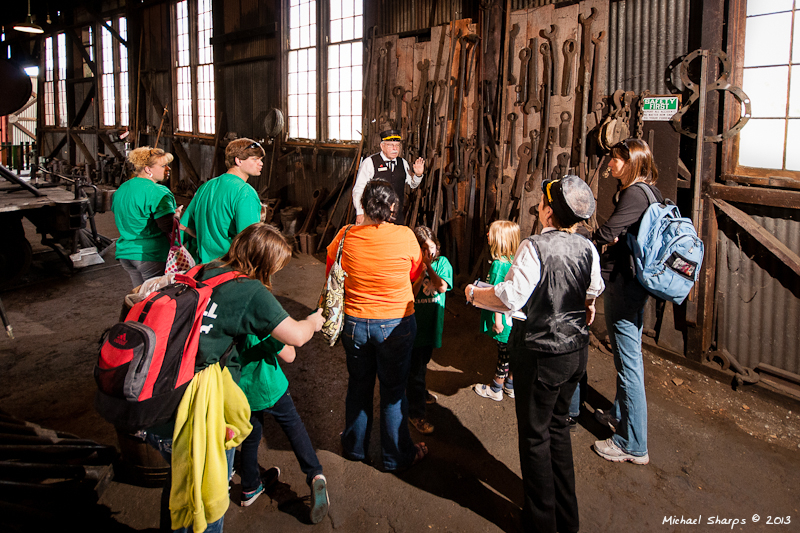 JAMESTOWN, Calif. (January 09, 2015) –Railtown 1897 State Historic Park (SHP) is seeking volunteers to help with education and interpretation programs at the park, and will be hosting an open house at the end of the month to offer more information. The Volunteer Open House will take place on Saturday January 31, 2015 from 10:00 a.m. to 2:00 p.m. at Railtown 1897 State Historic Park, located on 5th Avenue and Reservoir Road, Jamestown CA. All volunteer applications must be submitted no later than Thursday February 12, as training programs will begin on Saturday February 14. At the Open House, prospective volunteers will have the opportunity to meet Park staff and current volunteers, and learn about the various positions currently available. Informal tours of the operation will be conducted, and snacks will be served. While no previous experience with trains or public service is required, recruitment is also currently underway for Car Host and Tour Guide volunteer positions. Experience is not necessary- training will be provided. Railtown 1897 SHP is known for its century-old steam maintenance shops and train rides, including popular rides behind the famous Sierra No. 3 (also known as the “Movie Star Locomotive”). In addition to weekend excursion steam trains (April through October), Railtown 1897 SHP offers daily tours, roving interpreters, and many special events, including The Polar Express ™. Benefits for volunteering at Railtown 1897 SHP include membership in the California State Railroad Museum Foundation, free admission to and train rides at Railtown 1897 SHP and at the California State Railroad Museum, a variety of social activities, interesting training opportunities and guest speakers, discounts at the Depot Store, and participation in an annual volunteer recognition dinner. Interested volunteers can download a volunteer application at http://www.railtown1897.org/volunteer or call 209-984-4408 for more information.